Many small businesses start at home as a way to cut down on operating expenses, yet burgeoning entrepreneurs will often dream of their business growing beyond their home and into their own space. But what can be done when a business starts overwhelming a home but isn’t producing enough money to afford its own dedicated location? Below we explore three options for small business owners to consider as their company begins to take over their house. Where Am I Going to Keep All of This? All businesses, even home-based ones, come with plenty of materials. Whether it’s inventory, shipping supplies or equipment, all this stuff has to go somewhere in your home. As your business expands, it can feel like your house is getting swamped by all these extra objects that are potentially filling up many of the rooms in your house. If this sounds like you, consider dedicating a specific room or space in your home solely for business use. Even if this means just setting up a table in the corner of a room at first, having a business only space gives you a lot of benefits. Not only will this allow you to reduce the business clutter around your home, by having a business-only space you can actually deduct the cost of that square footage as a business expense, bringing down your taxes. As a home-based business begins to grow and acquire new clients, it can be important for business owners to keep their home address and other personal information separate from their business entity. Whether you don’t want unhappy customers showing up at your door or you want prospective clients to see your enterprise in a more professional light, setting up a virtual address can help you accomplish these goals while expanding your operations. A virtual address allows you to rent and use a prestigious, local address as your business address and gives you access to mail-forwarding and call-answering services. Depending on the plan you choose, renting a virtual office can help your business’ professional image and help you take some of that business clutter outside of your home by giving you access to real office space you can use to meet with your clients or get some work done. Another way to clear your home is to change how you do business. There are many options that are good for at-home businesses. For an e-commerce company, this can be something as simple as signing up for an. Under this business model, you simply mail your products to a fulfillment center and allow them to store, package, and ship everything out for you. Although this will increase your business expenses, it can be profitable in the long run by allowing you to handle a larger business volume than what would be possible from your home. 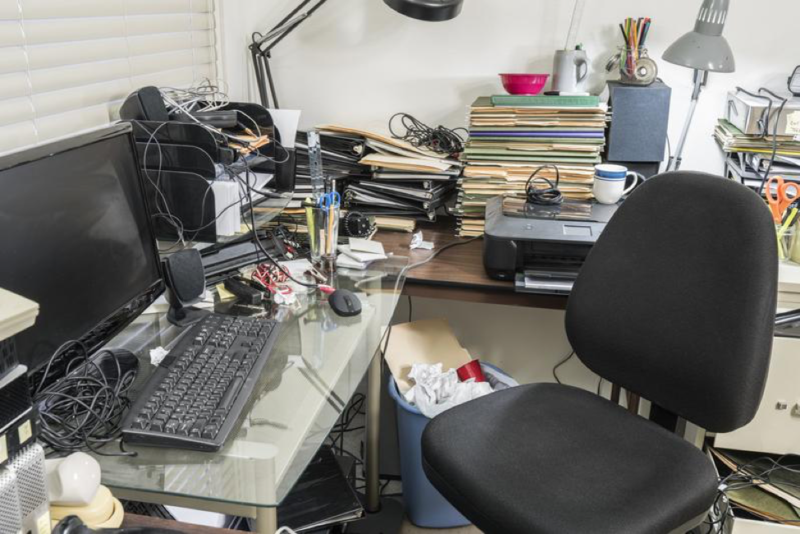 If you’re a business owner and you find yourself having to maneuver around all the business supplies in your home, you may want to consider applying some of these tips in order to have some space for yourself and your family again. For other great resources for business success, check out marketing software from HomeBizNetworks!